As a long-time New Yorker, I recall looking down Park Avenue from the Upper East Side and seeing the Pan Am building visually closing the avenue's horizon. The Pan Am building, with its futuristic rooftop helipad, was a symbol of sophisticated air travel. The building's architecture, though, did not win many admirers and when the helipad was closed after a major accident in 1977, it lost any remaining jet-age luster. The view downtown changed slightly when the current Met Life sign replaced the iconic Pan Am sign in the early 1990s, but the view is in the midst of a major shake up with the addition of the new skyscraper at 432 Park Avenue scheduled to be finished in 2015. This 1,396 feet high needle building will have 96 floors and certainly grabs your attention as you look down Park Ave. Artist rendering of the 2018 NYC skyline. 432Park is at left with color banding. Source: CityRealty. Time will tell if some of the controversy around the height of 432 Park will matter as numerous skyscrapers will remake our famous skyline by 2018. 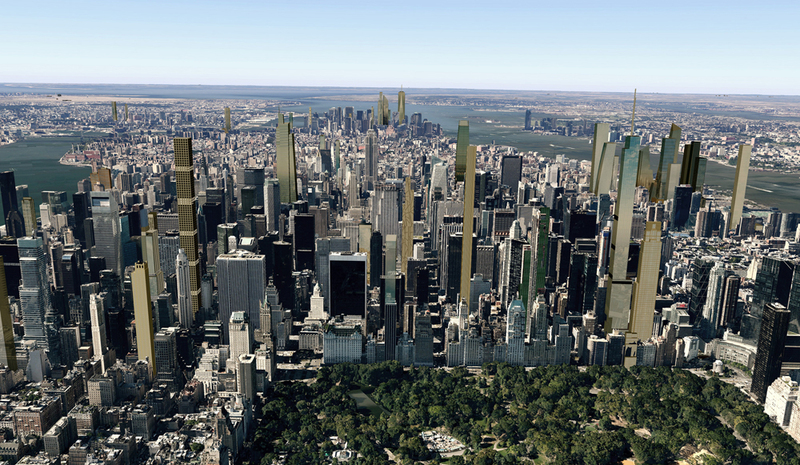 CityRealty released a number of renderings highlighting the vista-altering results of the current wave of development, one rendering which is shown here. 432 Park is marketed by Douglas Elliman, with many available listings. Call or email me to review any of these listings. In a future post, I'll explore in detail this amazing building. Looking down Park Avenue, 432 Park stands out. Met Life building in background. Source: CityRealty.